With the division of Andhra Pradesh in Telangana State and new Andhra Pradesh state, the Kuchipudi village now belongs to Andhra Pradesh with its new capital Amaravathi. In order to celebrate the formation of new Andhra Pradesh State under its Chief Minister Nara Chandrababu Naidu, Anand Kuchibhotla, Founder /Chairman of Silicon Andhra from USA, organized in collaboration with Dept of Language and Culture, Govt of Andhra Pradesh, the 5th International Kuchipudi Dance Convention at Vijayawada at specially constructed venue next to Indira Gandhi Stadium from 23rd to 25th December 2016. Known for his flawless organizing capacities, Anand Kuchibhotla with Silicon Andhra volunteers and various local Vijayawada authorities, in collaboration with Govt of Andhra Pradesh, gathered more than 6000 Kuchipudi dancers who arrived from abroad and within India to participate in the three day festival, showcasing a staggering variety of Kuchipudi dance drama tradition at the spacious Golden Hall which Kuchibhotla managed to create for presentation of dance dramas and group performances, including lec-dems and lectures, culminating into Mahabrindra Natyam for Guinness World Records. Large screens were placed on either side of the stage on which the proceedings were screened so that the large crowds could watch the various activities and also performances. The site was dazzling with Dashavatara figures on either side of Lord Shiva’s statue in the centre. And a moving camera was handled by the technicians projecting close ups as well as various scenes of dance dramas. The camera moved unobtrusively making it convenient for large gathering to watch the proceedings. The leading lights of Kuchipudi dance and celebrated gurus from Kuchipudi village were invited for the inaugural event. The CM, Chandrababu Naidu and other dignitaries including the Chief Justice of Supreme Court N.V. Ramana and a large number of Ministers and Mayor of Vijayawada, MPs, MLAs, MLCs, Commissioner of Police, Dist. Collector, Commissioner, Vijayawada Municipal Corporation and from Central Govt, M. Venkaiah Naidu, Minister for Urban Development were invited to make the event all inclusive. From Delhi the celebrated dancers Yamini Krishnamurty, Raja – Radha Reddy with Kaushalya Reddy, Swapna Sundari, Guru Jayarama Rao and his wife Vanashree Rao, renowned photographer Avinash Pasricha, from Hyderabad Shoba Naidu, from Visakapatnam Bala Kondala Rao and several other dance gurus and artists were invited to be a part of this three day event. The gathering was so vast that it is difficult to mention all names. Chandrababu Naidu announced that with the new capital coming up, the government support for further development of Kuchipudi dance form will take the art to greater heights. Barring Yamini Krishnamurty others gave lec- dems and performances. Swapna Sundari, Jayarama Rao and Vanashree gave performances. The morning’s inauguration event progressed to solo recital by Swapna Sundari, who as per tradition sang, used vachikabhinaya and presented excerpts from Bhama Kalapam. She has a melodious voice and her exposition was excellent. Vastly gifted, Swapna took us back to the halcyon days of dance as it was performed in the past. Since Delhi based dancers have won international reputation and have been in the field for more than 50 years, their contribution to popularising Kuchipudi is taken note of. From Kuchipudi village, traditional masters who came included Vedantam Radheshyam, Dr. Pasumarthy Seshubabu, Vithal (now settled in Delhi) and Pasumarthy Srinivas who paid tribute to PVG Krishna Sharma. Other invitees were Anupama Mohan now settled in Kerala (she used to play role of Narada in Vempati Chinna Satyam’s dance dramas), G. Padmaja Reddy, who recently received SNA Award and Vedantam Ramalinga Shastry. After the first session which began with Kuchipudi Shobhayatra, Dhwajarohanam, Kuchipudi Natya poorvarangam, the second session saw group presentation as well as solo performance by Shoba Naidu. The session also had lec- dem by Vedantam Ramalinga Sastry on Yakshagana and lecture by Dr. Pappu Venugopal Rao on Natyashastra. The emphasis was on group performances to highlight the Yakshagana aspect. Tributes were paid by Dr Bhagavatulu Sethuram and Dr. Jwala Srikala and group to late Dr. Uma Ramarao. The dance-drama ‘Mahishasuramardini’ by Bhagavatula Venkatarama Sarma, Sowmya and group was spectacular, with dynamic action and abhinaya, becoming the goddess empowered by various gods offering her their weapons to annihilate the demon. It had old world charm with attahasya, laughter, dialogues and war duel, the dancers performing with great energy, bringing out the essential dance drama nature of the Kuchipudi dance drama. The costumes were dazzling, with golden crowns and long flowing hair of the goddesses. The tableau often looked picturesque and the raw energy was captivating. One was transported to the old times watching exposition of the dance dramas in a village square. The troupe walked gracefully, with the lilting movements and both the entries and exits were in keeping with the old traditional style. It was common to majority of dance groups. It gave one an idea of the horizontal growth of the dance form. In what was formerly undivided Andhra Pradesh, across the various villages and cities the nurturing of Kuchipudi proved that it is a living tradition. It also dispelled the wrong notion that it is Capital centric art being popularised by few dancers and dance gurus. The tallest among the gurus, late Vempati Chinna Satyam’s innumerable disciples carry on his legacy giving training to several young dancers who perform the art with enthusiasm. This awareness has been made possible by such mega events and one admires Anand Kuchibhotla for his passion to support the art by drawing attention to Govt agencies and those whose job it is to support and promote art of dance. The second session also featured students of Shoba Naidu in group work tillana in Mohana Kalyani ragam. The training received by the young dancers was praiseworthy, though in the earlier session Shoba’s solo recital with her leg injury caused worry and one hopes she recovers soon. Vempati Chinna Satyam’s principal disciple and contemporary of Shoba Naidu, Bala Kondala Rao’s group presentation with her son Aditya Bulli Brahmam was impressive. The experience Bala has of having participated in Vempati’s dance dramas has stood by her in good stead. Aditya has received good training from his mother. The Kuchipudi Padya Natyam written by Jonnavithul Ramalingeswar Rao was presented quite late, so we missed it. However Bala’s training is much appreciated. In the post lunch session, the group of guru Uma Rani from Rajahmundry presented Gangadhar stuti displaying a variety of variations and finally how Ganga was received by Lord Shiva in his jata. Guru Jayarama Rao and Vanashree Rao from Delhi presented a tillana for Swati Tirunal’s composition which had novelty and also it retained elements of Kuchipudi. Both are versatile dancers. In Rupanurupa, the tradition of male dancer playing female role, Ajay from Vijayawada succeeded in impersonating female role, presenting Annamacharya’s keertanam “Itanikanta amri daivamu.” Senior students of Vizag Kalakshetra performed “Kanjadalayadakshi” with lilting music and interweaving various metaphors. The keertanams are a source for several compositions in Kuchipudi. Other presentations by Vishakapatnam based guru Thilagvathi’s group, from Srikakulam Guru Raghupatruni’s group and Guru Vempati Chinna Satyam’s daughter Vempati Sravani from Warangal were average in terms of standard. The performances extended beyond time, therefore we could not watch few performances. On the second day, morning sessions had interesting presentation by Dr. Yashoda Thakore of Ashtanayika. Yashoda has a mobile visage and she has been specialising in this particular genre of dancing .The ashtanayika categorisation with some of Kshetrayya’s javalis and padams offer scope to dancer to portray the abhinaya revealing state of mind in which a nayika behaves with her beloved. In depiction of Kalahantarita, separated from the nayaka after quarrelling and regretting, Yashoda showed range of emotions with intensity. Raja and Radha Reddy spoke about their journey in dance, their background and how they were in the beginning rejected by late Jagannath Sharma and how they went to Prahlad Sharma and studied Kuchipudi. Their going to New Delhi to learn choreography under Dr. Maya Rao and emergence as duet dancers performing Kuchipudi, support from well-wishers and hard work helped them to get established as popular Kuchipudi dancers, was interesting history sprinkled with several anecdotes. Indira Gandhi called them to perform before Fidel Castro of Cuba who enjoyed their performance. Later on they were invited to perform at Avignon Festival in France and since then they never looked back. Their success story showed their grit and integrity and determination to perform. Their daughter Bhavana Reddy presented from Bhama Kalapam one stanza of Vaiyru Satyabhama. Youthful and chip off the old block, Bhavana impressed the large crowd with her dancing. She appeared like a role model for young dancers. Raja explained how they extended the compositions using Ravi Shankar’s Nata Bhairav for tillana in Kuchipudi which was a thumping success. The use of Sufi song for Kuchipudi to extend its scope using other language compositions was a welcome attempt, but it would have been better if it were edited, because the large Telugu speaking audience could not follow the Sufi song. Raja and Radha’s tillana to music of Balamurali Krishna was received with enthusiasm. The session though long was much appreciated by the audience. The connection between Bhagavata Mela Nataka of Tanjore and Kuchipudi was explained by Melattur R. Mali’s Bhagavata Mela Natya Natak Trust. It was presented with excerpts of slides showing connections. The episode of Harishchandra natakam was performed remaining faithful to tradition as it is maintained in Melattur even today. This was an interesting feature of the conference. The discussion on Guru Shishya Parampara by Vyjayanthi Kashi and by special invitee Rathna Kumar from Houston, Modali Nagabhushan Sharma and Dr Chinta Ravi Bala Krishna group threw light on the legends and senior Kuchipudi dance gurus. Lec-dem by Pasumarthy Rathaiah Sharma with tarangam drew instant applause. Anand Kuchibhotla then briefed audience about Mahabrinda Natyam in which more than 6000 Kuchipudi dancers were to take part for Guinness World Record. The dance drama ‘Kanyakumari’ by Prateeksha Kashi with her guru / mother Vyjayanthi Kashi with well trained dancers was very professional. Prateeksha has blossomed into a fine dancer .The choreography was impressive and her own role as Kanyakumari was praiseworthy. Guru Challa Vedavalli and group from Kuwait with their dance drama ‘Kalabhairavashtakam’ won rounds of applause for Vedavallli’s impersonation of Kalabhairava. Far away in Kuwait she has been maintaining the tradition with fidelity. Guru Mahankali Suryanarayana Sharma’s group form Guntur presented ‘Ksheerasagara mathanam’ in traditional format. These are all time favourite themes and had usual spectacular costumes and ornaments. From Nizamabad, Devulapalli Prasanth’s group presented ‘Navarasa Alamelumanga Vilasam’ interweaving the story of marriage of Lord Venkateshwara and Alamelu and how the navarsas were evoked in different situations. The two dancers, Lena Lakshmi, disciple of Vempati Chinna Satyam from Kiev, Ukraine, and other Arunima Kumar from London performed together a number on praise of Lord Shiva. Both danced in unison showing command over good technique. Some dancers from Hong Kong also attended the convention though they did not dance. The range and scope of presentations by several groups was mind boggling. At times watching so many dance dramas each following in succession, we got exhausted. Towards night we watched Hyderabad based Vempati Chinna Satyam’s daughter Kameshwari Malalcheruvu’s group work. The atana jathiswaram choreographed by Vempati evoked nostalgia. On the final day on 25th December the morning was free for us. The Mahabrinda Natyam was to be presented at 6pm at Indira Gandhi stadium. The rehearsal was slated in the morning. Therefore we decided to visit Kuchipudi village. The last time photographer Avinash Pasricha and his wife Santosh and I had gone together for photographing gurus and performances was for my book on Kuchipudi in 1977. 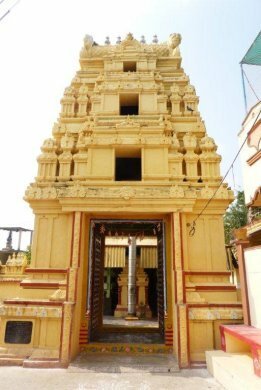 Kuchipudi village is nearly 30 kilometres away from Vijayawada and despite the fact that now the road is smooth and pucca, it took us nearly two and half hours to reach there. 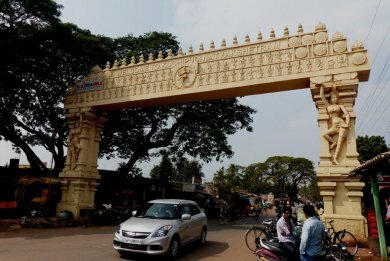 The entrance has the gateway torana with sculptures of various karanas and is very impressive. The credit for its construction goes to Venkat Vempati, elder son of Vempati Chinna Satyam. 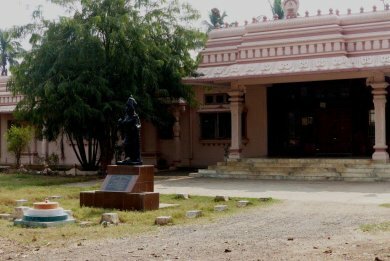 Few metres away is the Siddhendra Kalakshetra which is now under charge of Hyderabad based Telugu University. It now has a well planned building, with modern facilities, hostel, class rooms, library, kitchen and guest rooms. Since it was a holiday and all artists and gurus had gone to Vijayawada for Mahabrinda Natyam, it was closed. But few guest rooms, kitchen, and dining hall were open. We were disappointed as we were nostalgic about our visit and had stayed there to take photographs. After taking few photos we moved to Vempati Chinna Satyam’s residence near Balatripurasundari temple. 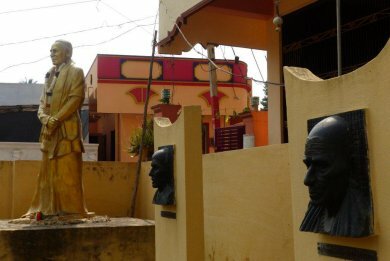 We visited the temple and Vempati’s residence compound where Venkat Vempati has erected statues of Vempati and other senior gurus. We also visited the place where construction of a hospital is to start. There we saw the board in Telugu ‘Jai ho Kuchipudi,’ but since none of us can read Telugu, the driver explained the spot reserved for the hospital. This will be the first hospital in Kuchipudi and will be available for nearby villages. As happens when we visit old places hoping to get glimpses of past glory, we get disappointed as the times have changed. The old gurus are no more there. Also we were told that the present college is under dispute as to who will run it since Telugu University is now in Telangana in Hyderabad. And this institution will have to be handed over to Andhra Pradesh Government. We also were disappointed to learn that since there are only few traditional gurus like Vedantam Radheshyam and Pasumarthy Rattaiah, how would students come from other cities to learn Kuchipudi. As a centre like a yatrasthal in nature of pilgrimage the visitors would come, but it will be serious responsibility for the Govt to attract students and offer all facilities and reputed gurus to teach traditional Kuchipudi dance. We felt sad as we had documented most of the gurus earlier and many have passed away. A serious problem for training of Kuchipudi by well trained younger generation of gurus will have to be resolved. Evening at Indira Gandhi Stadium, CM Chandrababu Naidu and from Delhi, M.Venkaiah Naidu, Minister for Urban Development arrived in time to witness Mahabrinda Natyam as part of grand closing ceremony. The stadium galleries were crowded with large number of people anxious to see more than 6,000 dancers performing. The groups were all well positioned and the arrangements were excellent. TV cameras and large screens were also placed. It was to be a live telecast. The choreography was by late Vempati Chinna Satyam coordinated by Vempati Ravi Shankar. The video practice was coordinated by Vempati Priyanaka and K. Vijay Shekhar. Besides the group performing, special performance of Ananda Tandavam by Guru Madhavapeddi Murthy as Shiva and Guru Jyothi Chintalapudi as Parvathi was arranged. As we had witnessed during 4th International Kuchipudi convention at Gachhibowli stadium at Hyderabad, the arrangements were made on a grand scale. The format was similar. There was a special officer deputed for award from Guinness World Records. The coordination was impressive. From tiny tots to young performers and also gurus, Mahabrinda Natyam scored in its execution and I was told that 6,170 performers had participated. It was declared successful and entered the Guinness World Record. Thus this mega event came to a close. I was also told that Silicon Andhra has been given permission to start the Kuchipudi College in USA and it will be affiliated to the institution in Kuchipudi village. It has to be seen how the strategies will be worked out to offer training for the traditional dance form. One hopes that with the resources available from Govt of Andhra Pradesh there will be progress and differences will be ironed out. Many have questioned the importance, relevance and utility of such mega events. It has both pros and cons but since the previous four international conventions have shown the awareness about Kuchipudi dance across the state, the villages and also abroad, with proper guidance the training part will be taken care of. The Kuchipudi village will gain in national and international importance. With visiting faculties, conferences, new choreographic works, scholarships, and various encouragements, it should be possible to work out the best for the dance form of Kuchipudi and development of the Kuchipudi village.